Recently, Bertalan Mesko (Berci on Twitter) was asking his twitter followers whether they had a favorite Web 2.0 story. Berci needed examples for his yearly “Internet in Medicine course” at the university of Debrecen. Doctor Ves (drVes) and Berci discussed various examples of blogs that had grown in a way: a blog that branched from blog to most popular podcast/physician-radio host (Dr. Anonymous), Kevinmd.com starting from a solo blog with 2-line snippets to a HuffPost-style conglomerate, DiabetesMine becoming a group voice with increasing popularity and industry recognition and Dean Giustini’s start from blog to the openmedicine journal based on WordPress. And while those are all great examples, I just wondered whether growth from single to multi-authored blogs is per definition “the best” and something one should strive for. Does growth in number of authors automatically mean: “growth” of the blog? And in what respect? Is sheer growth of traffic and a greater audience the most important? This blog regularly had guest posts in the pasts and they were surely an enrichment. Shamsha Damani was the main contributor. Her welcomed posts were in line with the theme of this blog (evidence based medicine, library-related topics), but had a fresh new look at certain topics (see for instance Grey literature time to make it systematic and Uptodate versus Dynamed. The post were written by Shamsha, but I reviewed them before publication. Because after all, I’m responsible for the blogs content. 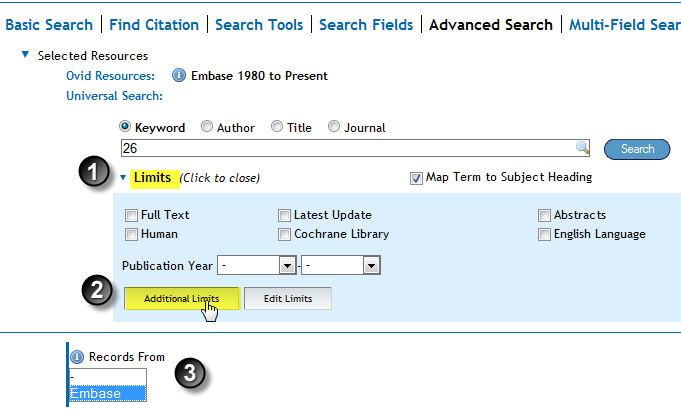 Guest posts/co-authorships can help to post more often. Variety in topics, style and perspectives may further engage the readership and enhance traffic. All good things. However, there is a big BUT, the BUT of quality and consistency. If the blog has a theme or a focus, all authors should more or less adhere to it. Writers can have different opinions and perspectives but these should not be in conflict with the basic principles. And it surely shouldn’t be nonsense! 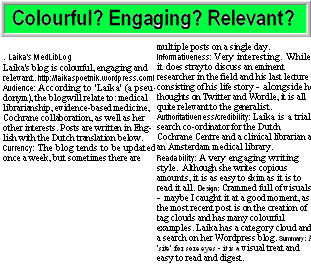 Good examples of blogs where authors replenish each other while adhering to a basic style are: Life in the Fast Lane (focus: emergency medicine and critical care, education, web.20 & fun) and the Health Informaticists (pretty much the scope of this blog: EBM, health 2.0, knowledge management). ….”it had become clear to both the editors of SBM and Dr. Tuteur herself that, although Dr. Tuteur had routinely been able to stimulate an unprecedented level of discussion regarding the issues we at SBM consider important, SBM has not been a good fit for her and she has not been a good fit for SBM“. Splitting up can be a good decision in case of unresolvable differences in approach. It was remarkable however that part of the readers (167 comments to the post) were sad about Amy Tuteur’s leave, because they found her posts stimulating and engaging. Some people like (literally) thought provoking posts, while others rather see thoughtful (and sometimes predictable) posts supported by evidence. Posts that don’t fit in can pose great credibility problems, not only for co-authored blogs, but also for blogs with guest posts. The well known KevinMD blog, cited above because it has grown from a single to a multi-author blog, recently came under fire because of a controversial guest post. Two (almost) equally famous “skeptic” bloggers devoted an entire post to this mishap, Orac of Respectful Insolence: “Say it ain’t so, Dr. Pho! Credulity towards alternative medicine on KevinMD” and Steven Novella at Neurologica Blog wrote That treatment is not based on science? Don’t Worry, says KevinMD. Don’t get so hung up on the explanation that you don’t believe in, that you’re unwilling to try a practice that might actually help you. Just keep an open mind. You don’t have to know everything about how things work; you just have to know that they work. Just like, do I really understand electricity or do I just know that if I turn the light switch, the light comes on? Weis tries to prove his point by saying that a highly prescribed drug as Lunesta has no known working mechanism either. Besides that this is ludicrous comparison, it isn’t true either. 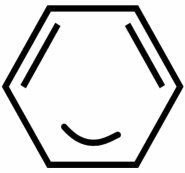 We do have a clue as to how Lunesta works (albeit falsifiable like everything in Science). Furthermore, Lunesta is effective whereas there is no such evidence for acupuncture or chiropractic. So should we just go and try and see instead of making an informed decision on basis of evidence and plausibility? This post is unlike the critical voice we usually hear from Kevin Pho. Regularly he warns against overtreatment and unnecessary screening, for instance. Weiss’s post on KevinMD is very disappointing, and unfortunately indicates that the filter on that blog for guest posts does not appear to be adequate. I hope it does not indicate a shift in philosophy away from science-based medicine, which would be worse. Orac is much harsher. He even devotes two posts to the topic. In style with the blog title he rages a respectful insolent rant: he will remove Kevin MD from his blogroll and will cease to recommend Kevin’s blog as a reliable source of medical information. I appreciate the critique. As readers of this blog know, I often post pieces here I don’t necessarily agree with myself to promote discussion and debate. Your concerns are certainly valid, and will be taken into consideration as I choose future pieces. Orac even spent a second post to show the ridiculosity of teaching the controversy in medicine by “posting pieces you don’t necessarily agree with” . What annoyed people the most was the lack of a disclaimer or an informed comment. Basically I agree that Kevin should select more critically* and if a bad posts slips through, he should retract, openly criticize, or at least (directly) comment to the post. Indirectly saying that you will be more careful next time is not enough, IMHO. Furthermore comments were closed very soon, not giving people ample chance to respond. On the other hand, Kevin agrees with the critique on multiple occasions. Also, I do not think that he has only traffic in mind when he includes many guest posts. He invites readers to “Submit a guest post to be heard on social media’s leading physician voice”. In line with this, Kevin once rejected a nomination in the Medgadget blog contests, probably so that some lesser known blogger would get more recognition out of the awards (roguemedic.com). Furthermore, many of the guest posts are interesting and of high quality. Thus, hopefully, this is an exception. Anyway, this incident illustrates a pitfall of multi-author or multi-guest blogs. Posts should not be in conflict with the basic principles of the blog. This will be directly noticed by experts in the field and certainly by skeptics), who immediately pounce on any contradictory message. But eventually conflicting standpoints may also dismay or -even worse- confuse other readers (patients, lay people). 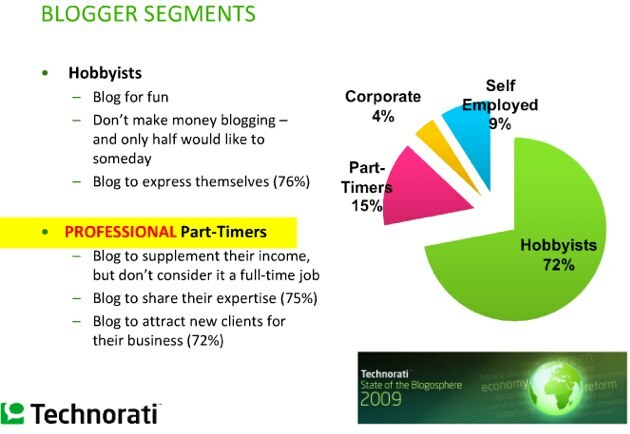 In the end blogging is not only about the traffic. It is about credibility. It is not even about your own reputation, it is about the credibility of medical blogs in general. *Earlier, in a short discussion on Twitter dr Ves pointed out: “Well, Kevin is the publisher and he decides what deserves to get in, readers decide whether to follow… Similar to newspaper”. He also stresses we can’t tell KevinMD what to publish. Which is true. However, Kevin Pho and other prominent medical bloggers have a great responsibility towards an audience consisting of people who seek to be well-informed. Medical statements should be accurate and assumptions should be plausible. By the way, even newspapers make corrections now and then. 2010 was heralded by Dr Shock MD PhD, followed by Emerging Technologies Librarian (@pfanderson) The Krafty Librarian (@krafty) and @Eagledawg (Nikki Dettmar). 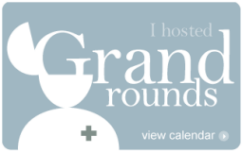 Last Month the round was hosted by Danni (Danni4info) at The Health Informaticist, my favorite English EBM-library blog. It is a great round again, about “dealing with PubMed trending analysis, liability in information provision, the ‘splinternet’, a search engine optimisation (SEO) teaser from CILIP’s fresh off the presses Update magazine, and more. Missed it? You can read it here. And now we have a few days left to submit our posts for the Next MedLibs Round, hosted by yet another excellent EBM/librarian blogger: @creaky at EBM and Clinical Support Librarians@UCHC. She would like posts about “Reference Questions (or People) I Won’t Forget” (thus “memorable” encounters that took place in a public service/reference desk setting, over your career) or “how the library/librarian” has helped you. But as always other relevant and good quality posts related to medical information and medical librarianship will also be considered. I am sure you all have a story to tell. So please share it with @creaky and us! As always, you can submit the permalink (URL) (of your post(s) on your blog) here. I would also like to take the opportunity to ask if there are any med- or medlib-bloggers out there who would like to host the MEDLIBS round August, September, October. The MEDLIBs Round is still called the MedLibs round because I got too little response (6 votes including mine) to the poll with other name suggestions. Neither did I get any suggestions regarding the design of the MEDLIBS-logo, Robin of Survive the Journey has offered to make [for details see request here]. I hope you will take the time to fill in the poll below, and to think about any suggestions for a logo. Thanks! Today I learned there were two more videos realted to the BlogWorld Expo, that I shouldn’t withhold you. First, the ABC News Covered the Medblogger Track At Blog World Expo. Here is an interview with Dr. Val Jones with Dave Lucas of ABC. ….”Dave Lucas is tired of all the false health information that fills his email inbox each day. He’s very relieved that there are physicians, nurses, and patient advocates “swimming against the tide” of pseudoscience and misleading health information online. Today Dave and I discussed how people can find accurate and potentially life-saving health information through peer-reviewed medical blogs, thanks to the health blogger code of ethics (administered by MedPage Today)”.